Blog > Performance Engineering > When is the Best Time to Start Performance Testing? 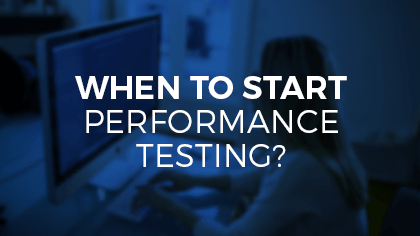 When taking into account the performance of existing systems or ones built from scratch, teams have to determine at what point in the development process they are going to benefit most from running performance tests. I’ve spoken about this topic at a couple of conferences, including the CMG imPACt Conference in La Jolla alongside Sofía Palamarchuk, and I thought, “Why not summarize the talk in a post?”. So, the purpose of this post is to answer the question: Should we start performance testing at the beginning, alongside development (taking the agile approach) or at the end (the waterfall approach)? There is a high risk that comes with waiting to assure performance at the very end because you never know how much work you will have in front of you to go back and fix things in order to reach your performance goals. When choosing between these two approaches, it is first important to take stock of the people, technology, and processes with which you have to work. It is important to have testers with both the proper soft and hard skills for performance testing. You also have to take into consideration which tools to use when load testing (ie, JMeter, BlazeMeter, Gatling, etc.) and monitoring both on the server side (ie, New Relic, NMON, perfmon, etc.) as well as the client side (with tools like Monkop, Page Speed, Yslow, monkeytest.it). Processes include test design, test automation, test execution, and measurement. When coming up with an execution plan, we recommend testing against a baseline and then use an iterative, incremental approach (I’ll write a follow-up post on what that means soon!). So, which approach is right for you? Well, it depends what your desired outcome is. At Abstracta, many of our clients come to us asking to take the waterfall approach, with the intention of running load simulations and acceptance tests before go-live of a new version of their system or after making a change to their architecture, etc. One instance in which we’ve done this was for a financial institution that had recently merged with another, and it needed to assure that after having doubled the number of accounts in its internet banking system, the performance wouldn’t suffer. Other clients have taken the performance engineering route, such as the e-commerce giant, Shutterfly, who runs performance tests continuously. This enables them to have a continuous integration environment, releasing updates frequently in order to enhance the user experience without allowing performance degradations. Read more about Shutterfly’s continuous performance testing scheme here. If you are looking for more support, check out our other performance articles or contact one of our consultants today to start performance testing. What are your experiences with the two approaches?